Semiconductor production comprises about 50 percent of Singapore's total electronics manufacturing industry. In 2006 alone, the island nation produced 10 percent of the world's foundry wafers. An island nation grows to make more room for expanding industrial sectors. he biomedical-manufacturing and transport-engineering clusters are behind much of Singapore's 21.6-percent year-on-year increase in manufacturing performance in July. The sectors increased 78 percent and 31.9 percent respectively. Other sectors registered more modest increases. Precision engineering grew 2.8 percent; electronics grew just 0.02 percent; and chemicals contracted about 2 percent, due to a decline in the petroleum segment. August numbers are less impressive, but healthy nonetheless. Biomedical manufacturing performance grew 49 percent compared to August 2006, and transport engineering rose 19.5 percent. Even the chemicals sector grew by 6.4 percent that month. So, does Singapore merely have a highly productive work force across industrial sectors, or is there more to it? Part of the answer lies in the steady flow of new projects coming to Singapore, increasing the output of sectors referenced here and others. Given its proximity to all of Southeast Asia's key markets, Singapore is a leading contender for R&D, regional headquarters, logistics and manufacturing operations. Meanwhile, ongoing land-reclamation projects are expanding the size of the island nation, which currently is just 270 sq. miles (704 sq. km.). In 1960, however, land area was 224 sq. miles (581 sq. km. ); in 1990 it was 244 sq. miles (633 sq. km.). By 2030, Singapore will have increased another 38 sq. miles (100 sq. km.). 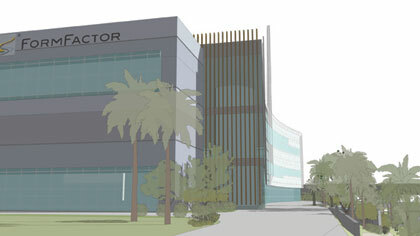 Calif.-based FormFactor broke ground on a 300,000-sq.-ft. (27,870-sq.-m.) expansion of its wafer probe card manufacturing facility in Singapore's Tampines district. • Genentech broke ground in June on a US$140-million microbial-based biologics manufacturing center at the Tuas Biomedical Park. The facility is the first of its kind in Singapore, and Genentech's first in all of Asia. The plant will produce bulk Lucentis, a treatment for macular degeneration. • Merck Sharp & Dohme, the Asia-Pacific division of Merck & Co., recently completed a $100-million investment in an expansion to make space for new product introductions at its complex in the Tuas Biomedical Park. To date, Merck has invested more than $650 million at its 49-acre (20-hectare) Singapore site. In August, Merck opened its regional headquarters at Parkview Square in Singapore, underlining the importance of Singapore to Merck's Asian presence. "With a strong, direct presence in Asia, we can better understand and respond to the needs of patients and customers and contribute to improved health care in the region," says Ramesh Subrahmanian, president of Merck's Asia Pacific Human Health division. "We will strengthen our engagement with the scientific community and work closely with the public health stakeholders in Asia." 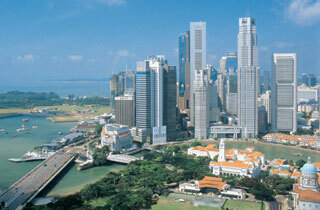 Merck's Singapore operation has introduced eight new products since 2002. • On the high-tech side, Livermore, Calif.-based FormFactor broke ground in September on a 300,000-sq.-ft. (27,870-sq.-m.) expansion of its wafer probe card manufacturing facility in Singapore's Tampines district. Like Merck's expansion, FormFactor's $200-million investment is as much about Asia as it is about growing in Singapore. "Singapore offers a business-friendly environment and a gateway to all of our customers in Asia," noted Igor Khandros, CEO, at the groundbreaking. "We consider this expansion an important next step in better serving the needs of all of our customers." FormFactor's customers are semiconductor manufacturers who use the wafer probe cards to test integrated circuits. • Another supplier to the regional semiconductor manufacturing industry is Kanto Kagaku Singapore, a division of Kanto Chemical Co. (Japan). The company broke ground in September on a $13.5-million factory for producing highly purified chemicals for semiconductor production processes. "With a strong, globalized and booming electronic base here, particularly in the areas of semiconductors and hard disk drives, Singapore makes an excellent location for expanding Kanto's business," said Tomoyuki Ono, managing director. "It has always been our choice as a regional headquarters and is an important strategic market for Kanto Chemical to build its business network into neighboring countries and Asia."